Flammulated owl (photo from Greg Lasley, USGS). The flammulated owl is a small (6-7” long) dark-eyed owl (Figure 1), more often heard than seen, that inhabits dry montane forests of eastern Washington. Flammulated owls are known for their ventriloquial hoots (McCallum 1994). Their breeding range extends from southern British Columbia to Mexico. Flammulated owls are largely insectivorous, and migrate south when cold temperatures make insects scarce, wintering from central Mexico to El Salvador (McCallum 1994). Flammulated owls are a late spring migrant, with most arriving in Washington in late May (Buchanan 2005). After young are fledged by about mid-August, they cease to vocalize and are less often detected. 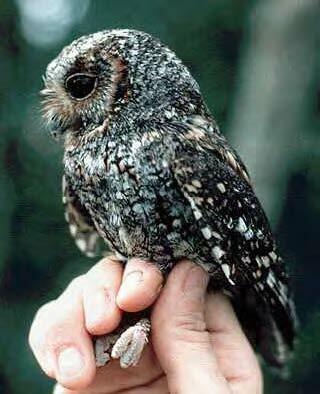 Flammulated owls eat nocturnal arthropods, primarily noctuid moths, crickets, grasshoppers and beetles (McCallum 1994). They nest in natural cavities and old woodpecker holes, and they may compete with bluebirds (Sialia spp. ), northern flickers (Colaptes auratus), and northern flying squirrels (Glaucomys sabrinus) for nest sites. Linkhart and Reynolds (2007) reported high fidelity to breeding territories in Colorado. Flammulated owls have a lower reproductive rate than most other North American owls. Clutch size is usually 2-3, and occasionally 4 eggs (McCallum 1994). In northeastern Oregon, flammulated owl territories are often in forests of large diameter (>50 cm dbh) ponderosa pine/Douglas-fir or grand fir with ponderosa pine in the overstory (Bull et al. 1990). 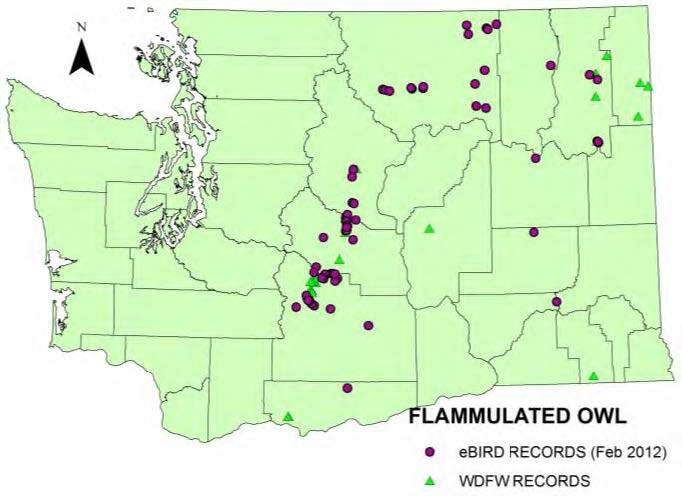 In Washington, flammulated owls are an uncommon to fairly common summer resident in the ponderosa pine zone of the Cascades, northeastern Washington, and Blue Mountains (Figure 2; Buchanan 2005). Jewett et al (1957) considered the flammulated owl a rare species, but with higher numbers of field observers in recent decades, it is evident that they are not rare in appropriate habitat. Flammulated owl abundance may have declined in response to timber harvest and the effects of fire suppression. Dry forest management that restores more open structure of pine and mixed conifer stands may improve habitat conditions for flammulated owls. The most immediate threat may be cutting of snags for firewood (McCallum 1994). Aerial spraying of BTk or carboryl-based insecticides suppress non-target moths, and may negatively affect flammulated owls. Flammulated owls have received little study in Washington, and there are few data on basic aspects of their biology such as abundance, habitat use, and reproductive ecology. Surveys. In 2011 and 2012, WDFW conducted surveys using a standardized protocol involving broadcasts of recorded calls at points along specified routes in potentially occupied habitat (Fylling et al. 2010). Biologists in four WDFW regions conducted road-based surveys for flammulated owls in five forest cover types (lodgepole pine, mesic forest, mixed conifer, oak woodland and ponderosa pine). Each route consisted of 10 stations that were >1 mile apart and visited on 3 occasions. In 2011, surveys were conducted on 9 routes (270 station visits) and there were 17 detections of flammulated owls. In 2012, there were 46 detections during 925 station visits on 13 of 31 routes surveyed. 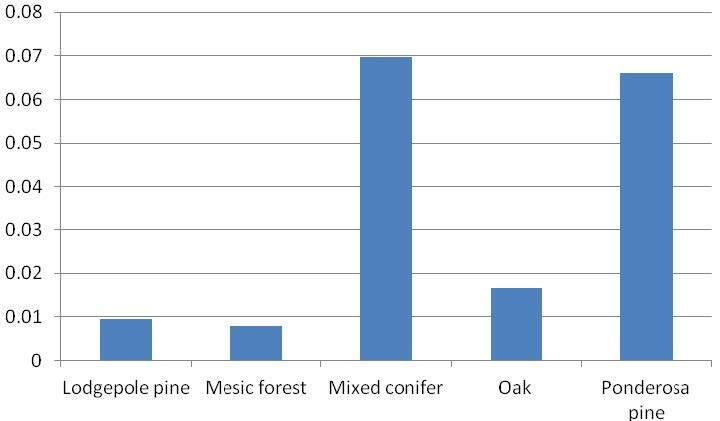 Owls were detected in all 5 cover types, with most detections occurring in ponderosa pine and mixed conifer cover types (Figure 3). This project was part of a multi-state effort and Washington data will be included in a multi-state analysis to better understand distribution and habitat use. Migration research project. A project to identify migration routes and wintering areas of flammulated owls is underway using geolocators (Figure 4); data from geolocators can be used to identify migration pathways and wintering areas. In 2012, there were 3 main study areas: 1) the Naches Ranger District, Wenatchee National Forest in Washington; 2) north- central Utah; and 3) the Manitou Experimental Forest, near Colorado Springs, Colorado. Plans for 2013 include recapturing marked owls and deploying geolocators in northern California. Partners and cooperators. 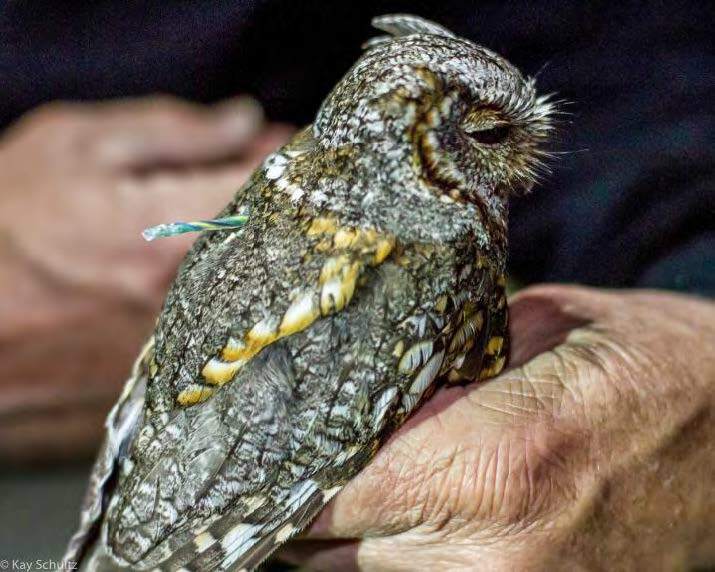 Boise State University, Global Owl Project, HawkWatch International, Idaho Bird Observatory, Partners in Flight, Rocky Mountain Bird Observatory, Southern Sierra Research Station, U.S. Fish and Wildlife Service, U. S. Forest Service. Buchanan, J. B. 2005. Flammulated owl. Pages 211-212 in T. R. Wahl, B. Tweit, and S. G. Mlodinow, eds. Birds of Washington: status and distribution. Oregon State University Press, Corvallis. 436 pp. Bull, E.L., A.L. Wright, and M.G. Henjum. 1990. Nesting habitat of flammulated owls in Oregon. Journal of Raptor Research 24(3): 52-55.
eBird. 2012. eBird: Avian online database of bird distribution and abundance [web application]. Cornell Lab of Ornithology, Ithaca, New York. http://www.ebird.org. (Accessed: 24 Feb 2012). Linkhart, B.D. and R.T. Reynolds, 2007. Rate of return, fidelity, and dispersal in a breeding population of flammulated owls. Auk 124(1): 264-275. McCallum, D. A. 1993. Flammulated owl (Otus flammeolus). No. 93 in A. Poole and F. Gill, editors. The Birds of North America. Academy of National Science and American Ornithologists Union, Philadelphia, Pennsylvania.